Reiki, the word, is Japanese. It is written with 2 Japanese kanji (kanji means Chinese characters). These kanji mean “spiritual energy”. In the recent past the two Reiki kanji have been translated as ‘Universal Energy’ (or Universal Life Force Energy) in the West. This is obviously a translation of the 2nd kanji, Ki, only. Ki is naturally the energy of everything. Today a common translation is “Spiritual Energy”. Modern Japanese often find the kanji for Reiki to be ‘spooky’ therefore in Japan these kanji are not used. Instead a different script that is phonetical and does not contain meaning (katakana) is used. The origins of the Japanese kanji for Reiki are very beautiful indeed. The Chinese writing system of kanji was adapted by the Japanese from around the 4th century AD with many believing that prior to this Japan had no writing system itself. Chinese characters are one of the earliest forms of written language in the world. Below is a timeline from the first known Chinese scripts called Oracle Bone Inscriptions. To the right is an example of a tortoise shell Oracle Bone. The script became more abstract over the centuries leaving Japan with a quite diffferent script today. On this webpage you can see the script changes from the time of the Oracle Bone characters in China. This time line will be useful for listening to Calligraphic Artist, Vikki Quill, talk about the origins of the word Reiki. Vikki has also completed another podcast with the International House of Reiki which you can access here called Connecting with Reiki Kanji through the Art of Calligraphy. In the interview on this page Vikki pieces together different interpretations by Japanese etymologists to give an artistic understanding of the meaning behind Reiki. Vikki has studied with one of Japan’s foremost teachers of Oracle Bone Calligraphy, Kato Koho, the founder of Kikkokai, The Oracle Bone Writing Association. These were inscriptions on tortoise shell and bone. They were used for divination. Only approximately one thousand of the over 4000 characters inscribed on the oracle bones can de deciphered and understood today. During this period inscriptions were also found on Chinese bronzes such as zhong (bells). Seal script lies at the origins of the standardized, formal script used throughout China. Chinese small seal characters were known to have come to Japan as early as 57AD but it was from the 4th century A.D. that the Chinese written language was used in Japan. From the 6th century onwards, Chinese documents written in Japan were altered to make them more Japanese. After World War II the Japanese government simplified the system of Japanese kanji use, called the “Tōyō Kanji Character Form List”. The number of characters in circulation was reduced, and formal lists of characters to be learned during each grade of school were established. The characters that the International House of Reiki use for Reiki are the ones that were used at the beginning of the 1900s during the founder of Reiki’s lifetime, Usui Mikao. At the bottom of this page you can see the pre-war and post-war styles of how to write the kanji Reiki. Chinese Etymologist, Li Leyi gives two ancient characters for Ling. The first is the earliest known character and is an oracle bone character. The picture here of Rei (Ling) is an Oracle Bone Inscription and shows falling rain. Shiragawa Shizuka, the Japanese etymologist also lists the 2nd entry in the column of this picture as an oracle bone character. He refers to the 3 vessels shown here and in the main picture of the following bronze inscription in Li Leyi as the vessels used by the sorcerer for holding ritual prayers. He suggests that this combination of rain and vessels indicates the prayer for rain. It has also been suggested that the sound of rain on the metal vessels may have been a way for the people to BE with the gods. This second character which we use within the system of Reiki to signify Reiki, according to Li Leyi had the original meaning of “gods”. This is a bronze inscription character and so is a later development from the oracle bone inscriptions. In this picture, the three vessels mentioned above are clearly shown. The top part signifies “drizzling” and the lower part shows both the three vessels and an altar or sacrificial table. Sometimes a “jewel” or “heart” element replaced the altar shown in this character. The third entry in the column to the right of the picture shows the sorcerer element being introduced in the later small seal script. Shiragawa however, in his dictionary “Kanji Ruihen” has an entry for Rei in the bronze inscription script which has the sorcerer element. It is explained as a combination of Rei and Miko (sorcerer or shrine maiden) He says this Rei does not mean “spirit” but shows a code of behaviour associated with the prayer for rain. He suggests that the previous character was used to mean “spirit” and that this character came to mean the “majesty or authority of Nature”. The earliest character for Ki was three lines meaning “sky energy”. 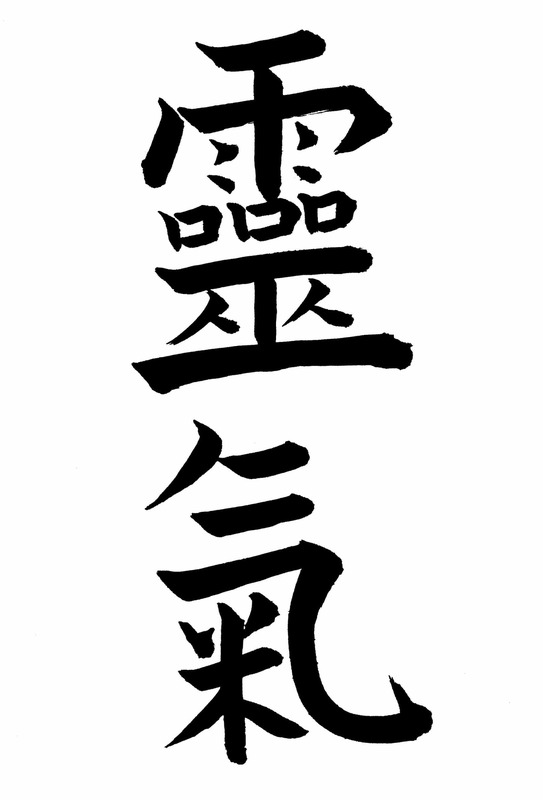 The Ki that we use in Reiki is a seal script character (from around 200 BC). This is a keisei character which means that one part of the character provides the meaning and another part the pronunciation. In this character, the three lines forming the top element give the pronunciation of “ki” and the asterisk-like form under that gives the meaning, that of ‘rice’. This possibly indicates that the character’s original meaning may have been associated with “offering food to the Gods and dead spirits (ancestor worship)”. To pronounce the word ‘Reiki’ in Japanese it is necessary to forego any preconceptions about language. The first sound in ‘rei’ is neither an R nor an L, as some Westerners believe. In Japanese the sound is in fact somewhere in between the two letters. The Japanese language has no correlation with English or its pronunciations. The first time that the government initiated a standardized system and romaji (English letters used to translate kanji) were introduced was in 1885. The kanji for ‘rei’ ‘is officially spelt with an R when translating into English and is therefore pronounced with an R (even though the Japanese pronunciation might sound similar to what is understood as an L in English). There are different styles of calligraphy. Here are 3 modern styles and one older style. The older style would have been in use at the time Usui developed his teachings. 1. Sosho Modern Cursive style. This is a kind of simplified shorthand that is drawn according to esthetic standards. 2. Gyosho Modern Semi cursive style. A simplification of the standard style, allowing it to be written in a more flowing and faster manner. 3. Kaisho Modern Standard style. This style is similar to the printed style of kanji, and is taught in schools. 4. Kaisho Old Standard style. This is the standard style written in pre-World War II and was how Reiki was drawn during Mikao Usui’s lifetime.